With the aim of examining war crimes committed by the United States in Vietnam, Bertrand Russell summoned 15 public figures like Lelio Basso of Italy to gather in London, in November 1966. The first session of the first tribunal convened by the British philosopher was presided over by Jean-Paul Sartre. Members of the tribunals included Julio Cortázar, Simone de Beauvoir and Lázaro Cárdenas. After Russell’s death, the tribunals that bore his name became permanent, encouraged by dignitaries such as one of Lelio Basso’s own disciples, the jurist Luigi Ferrajoli. As heir to this tradition, today’s Permanent Peoples’ Tribunal (PPT), established in 1979, has reviewed cases of serious human rights violations that we now consider crimes against humanity perpetrated in a number of different places in the world, including Western Sahara, Argentina, Eritrea, Philippines, El Salvador, Afghanistan, East Timor, Zaire, Guatemala, Nicaragua and Colombia. The information that we share in this note about these tribunals of conscience comes from an interview we did with José Roberto Ruiz Saldaña, one of Luigi Ferrajoli’s disciples, who explained the origin and current importance of the Permanent Peoples’ Tribunal (PPT). No less valuable was the initiative of Lelio Basso, “the noteworthy Italian political leader, a Constitutionalist who suffered the harsh rule of Mussolini, enduring persecution and imprisonment.” Basso reintroduced the option of the public opinion tribunals: “We recall that the coup d’etat in Chile took place in 1973 and that the atrocities of the Pinochet dictatorship motivated Lelio Basso to take up the idea anew. He felt that action was obligatory.” Thus, new sessions of the Bertrand Russell tribunals were held at the beginning of the 1970s, this time dealing with the dictatorships of the Southern Cone. The utilization of ordinary courts of law, UN bodies, or regional tribunals “is important, but when one realizes that a human rights culture also advances via the promotion of a democratic culture, one based on legality and the value of persons, the appeal to a public opinion tribunal takes on the same level or proportion of importance as the appeal to legal, jurisdictional channels. Dirty war, violence and human rights violations: Violence against the people of Mexico ranging from the massacres perpetrated in 1968 and 1971, to more than 90,000 deaths in the war on drugs and repression against the citizenry during the present term of office. Violence against women and feminicides: All forms of aggression, violence and murders of women in Mexico cloaked in impunity. Violence against migrants: Kidnappings, executions and forced disappearances of Central American migrants in Mexican territory, and the lack of protection by the Mexican State for our fellow citizens who have emigrated to the United States in search of opportunities they do not have in Mexico. Violence against nature and environmental devastation: The destruction of the territory, biodiversity, water, flora and fauna, and the rural, campesino and indigenous way of life that coexisted with and preserved these ecosystems. This violence has been aggravated with megaprojects such as dams and reservoirs, mines, railroads, and the expansion of ports, tourist corridors and even would-be natural wildlife preserves that exclude indigenous farmers, but not World Bank projects that plunder the biodiversity. Corn and life in the Mexican countryside: A thousand-year-old plant, the basis of the civilization and culture of Mesoamerica now under attack, its diversity threatened by genetically modified plants in the context of a policy of dismantling and destroying farm life in Mexico in order to expel the now proletarianized farm labor force to the cities. Violence against labor: The destruction of workers’ rights, won during a long series of historic struggles waged over centuries and now canceled or repealed through acts such as massive firings, unemployment, underemployment, informal employment, increasing precariousness, outsourcing and all forms of work without job benefits or social security. News media: The concentration in a few hands of the high-technology news media like television, radio, telephone and internet services, coupled with the exclusion, criminalization and persecution of free, alternative and community media; attacks, murders and hostility against people engaged in communications, news reporting and journalism, along with attacks against freedom of information and expression, as well as the right of all Mexican people to be informed. 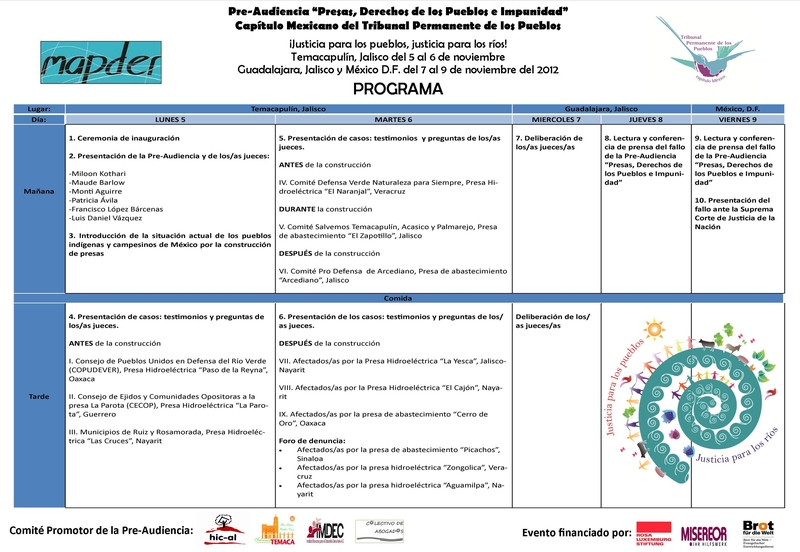 As part of the PPT Mexico Chapter’s discussion table on environmental destruction, a pre-trial on the construction of dams and reservoirs in Mexico will be held on November 5 and 6 in Temacapulín, Jalisco. 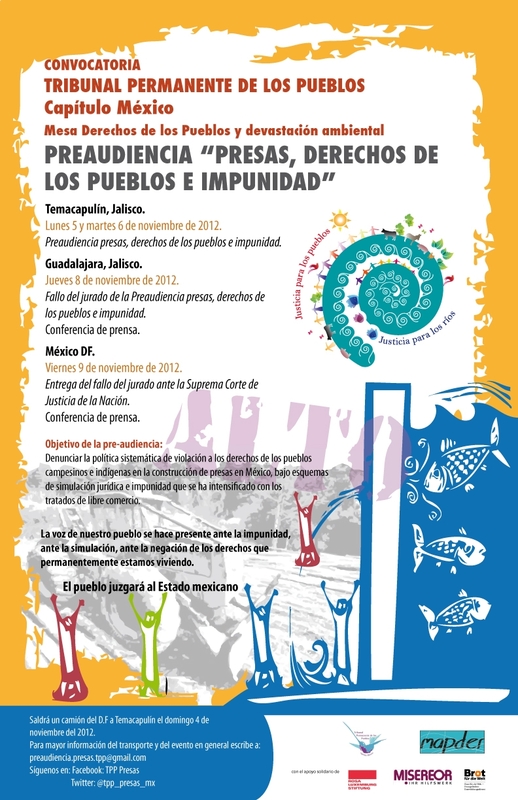 Denunciations will be heard regarding the effects on numerous communities and peoples, some of whom have already been displaced and others who have been threatened with forced displacement; accusations will also be heard of serious environmental human rights violations that have occurred due to the imposition of such projects, and their implications for the process of the privatization of community property: water and territories. At the pre-trial, the affected movements from various states in Mexico will present 8 cases related to hydroelectric and water supply projects. A space for denunciations will also be opened in order to receive testimonies of other cases that have not been previously shared with the pre-trial jury. The interdisciplinary pre-trial jury is made up of: Miloon Kothari, former UN Special Rapporteur on the Right to Adequate Housing and member of the Housing and Land Rights Network, South Asia Regional Programme (India); Maude Barlow, President of the Council of Canadians (Canada), and Senior Advisor on Water to the 63rd President of the General Assembly of the United Nations; Monti Aguirre, Latin American Program Coordinator at International Rivers (USA); Patricia Ávila, researcher at the Laboratory on Political Ecology and Society of the Ecosystems Research Center, UNAM, and recipient of the National Medal of Science, 2003 (Mexico); Francisco López Bárcenas, attorney (Mexico); and Luís Daniel Vázquez, Coordinator of the Doctoral Program in Social Sciences of the Latin American Social Sciences Institute (FLACSO). On November 8, the jury will hold a press conference in Guadalajara regarding the final pre-trial verdict and another in Mexico City on November 9. Esta entrada fue publicada en defensa del territorio, Invitación, Noticias, REPRESION POLÍTICA Y DEFENSA DE LOS DERECHOS HUMANOS, Solidaridad, Tecama Resiste, Tribunal Permanente de los Pueblo. Guarda el enlace permanente.